enjoy seeing the 'Something New' cards created by the DT. I used a small 5" square white card. a project book from Hunkydory Crafts Ltd. I coloured the flowers and butterfly with Promarkers. Labels: Dies, Hunkydory Cardmaking Collection, MTTC, Thank You Card. well and looking forward to the Christmas festivities. T is for Trees - so any tree, or trees . On a white 6" sq card, I laid a sheet of tartan paper from my stash. A sheet of Kraft Card added to the tartan. The background winter scene is by Hero Arts, stamped in black. from a stamp set - Pinescape. I edged the Kraft card with Frayed Burlap and Vintage Photo. I wrapped around a dark green chiffon ribbon. Challenge #111 - Santa Claus is Coming to Town. as being a Vintage Santa. I used Promarkers to colour. A Gold glitter pen for the star. Thanks again for your visit and comments. at Back to Basics and Beyond Challenges. to also see the interesting projects made by the DT. The stamp used is Flying Stars by Penny Black. Heat embossed with white detail embossing powder. Tumbled Glass, Squeezed Lemonade and Spiced Marmalade. S is for Season's Greetings. I have a 6"sq white card. Paper is from a paper pad in my stash. The stamp is by Woodward Stamps. the number 25. Ribbon and Card Candy added. Hello again, a busy week for me, so much to do. Please pop by the blog to see the DT's inspiration. Making Cards and Papercrafts. Stamped with Gathered Twigs DI. Fastened purple and yellow twine around the mat. A raffia flower with a lilac gem in the centre. A die cut sentiment - Happy Christmas in Black. challenge for the next two weeks at Cardz 4 Guyz. Please pop over to check out the DT's wonderful art work. from my stash - oriaginally from Poundland. An oval Spellbinders and a greetings die. The Snowmen stamp is by Woodware. Crystal gems, glitter and fluffy stuff added. at The Holly and the Ivy Christmas Challenges. Please pop over to check out the blog and DT work. My card is full of bling this time round. Gold mirri card ( no it's not yellow) and green. card candi and Sparkly pens. The greeting is by Crafter's Companion. a purely selfish indulgence, if I am not sharing it with anyone. please pop over to the blog to check them out. To embellish I added 4 black crystal gems. Hello , it's amazing how Christmas comes upon us. for the next two weeks at My Time To Craft. One layer only - or stamped direct onto card. Please check the blog and see the DT's ideas. I placed a red and white spotted paper onto my 6" sq. card. Stamped onto a smaller piece of white card. magazine Making Cards and Papercraft. I enjoyed making the scene with Santa, the presents and holly. Coloured with Promarkers, glitter and a white gel pen . We hope you are learning a few new card making designs. Stamping and colouring onto Vellum. I used a Honey Doo Crafts stamp - Floral Crest. but hey that is for another day. Flipped it over to the backside and used Promarkers to colour it. Hope you have a go and enjoy the creation of your card. inspirational cards by the DT. the main stamped image area. The added sentiment stamp is by Dreamees. R, so we have R is for Reindeer. easy, please be sure to read them. a paper pad The Magic of Christmas,. The image is a free digi stamp via Pinterest. Coloured with Promarksers and glitter pens. A die cut sentiment to complete. Have fun. Cardz 4 Guyz - #208 Christmas Critters. inspiration, again some wonderful creations from the team. The sentiment stamp is by Crafter's Companion. A Little Bit Sketchy - Faith. Check out the blog for details and to see the DT cards. paper pad. - The Magic of Christmas. 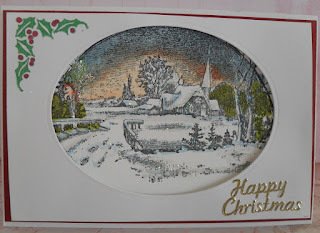 The stamped image 25 December is by Woodware stamps. Coloured with Promarkers. Ribbon and Card Candy added. our two weekly challenage Let It Snow. even if it really looks nice on Christmas cards. Please visit the blog to see the details and the DT examples. and of course lots of glitter to highlight the snow. The corner stamp is a really old Clarity stamp. Matterd onto red card, with an oval aperture. Enjoy , I look forward to seeing your snowy cards. Janis chose Things of Fall/Autumn. in black onto the card. blended Distress Inks using many autumnal colours. The leaves and acorns were stamped with Black Versafine. Clear Embossing powder to heat emboss. Additional colour added with Promarkers. foam pads. Finally the sentiment was added. Have fun, thanks for your visit. Please pop over for the details and to see the cards by the DT. for around the edges of the holly. Hello and welcome ot my blog, thanks for your visit. to see the wonderful projects made by the DT. Tags are by LOTV. - Snowflakes -The Works dies. varied blue Promarkers and pencils. Of course there is glitter scattered all over. at My Time To Craft. Making Cards and Papercraft magazine. details and to see what the DT have created to inspire you. I used a white straight edge card 6" sq. A dark blue mat. A white card embossed with snowflakes. painted holly corner. A silouette stamp of Santa and sleigh. Sheena Douglass - Bah! Humbug Set 1. Coloured with Promarkers with lots of glitter added. Have fun creating, happy crafting. follow, the details and of course the inspiration by the DT. My card is a Kraft 7" scallop edge card. Wild At Heart - First Edition - Trimcraft. the centre panel waterolours were used. Have fun using the sketch, I look forward to seeing your entries. Please pop over to see the blog and the DT creations. a stamp by LOTV - Penguin Pals. coloured with Promarkers and fine line pens. Glitter is scattered here and there. The die cuts are the sentiment, silver mats and the snowflake. Happy card marking, have fun. Hello, welcome to my blog. Thanks for your visit. The image is a freebie Digi download I found on Pinterest. I used paper from a Christmas paper pad from my stash. Coloured with Promarkers and a few fine pens. Glitter added here and there. high prices for 'fat' postage. stash to cover 3/4 of the card. A topper onto the paper then white card. with a crystal gem in the centre. A sentiment stamp from Crafter's Companion. For those who may or not have tried using them , now is your chance. For my card, I have used a 6" square scallop edge card. The stamp is Meadow Flowers from Woodware Stamps. Light blending around the edges with the Mustard Seed. Black edges created with a black pen. Have fun. Thanks for your visit. I made a 5 x 7 black card. I painted the flowers with 3 Zig Brush Pens. I added an stamped sentiment Inspire again by Woodware. I decoupaged 3 of the flowers, added black gems to the centre. Gave a dotty surround on the main image sheet. Have fun with your Colour Project. well and enjoying your crafting. creations by the Design Team. Create and Craft Member's Blog. 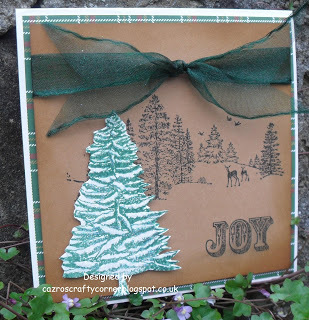 I added brown card, a stamped greeting and sentiment. challenge . #82 Fancy Folds has been chosen by Sue. A simple fold card was my choice for another Christmas card. The snowman Santa is by Little Claire Designs. Coloured with Promarkers and Sakura Gel pens. Have fun, hope to see you giving this one a try. Hello, how are you, thanks for popping by. Added two strips of ribbon and a stamped sentiment. challenge sounds as intriguing as I first thought it to be? Triangles made by the team. Black, grey, white and silver mirri card. Embossing folder of metal tread on the grey paper. Stamp from Stamps By Me. Have fun with your triangles, one or more. at Back to Basics and Beyond starting today. ideas from the Design Team, as are the details. Distress Oxides and a few small texture stamps. Watercoloured with Distress Oxide inks. The sentiment is by My Paper World. Have fun, hope you get splashing and mixing. Sybrina has chosen a lovely one for you. Please pop over for details and to see the DT cards. I made a square card with papers from my stash. Small labels are by LOTV. Have fun, thanks for calling in. info to help you join in. My card is made with a mix of beige and red card. are all by Little Claire Designs. natural world, be it flora, fauna, feathers or fur. Please visit us to see the creations by the DT. I decorated an MDF tag, painted with acrylic paints. I cut panels of mount board, painted and stuck to the MDF. Stamped buterflies, onto coloured papers. Added words and wooden hearts. Please pop over to see the creations by the DT and for the details. My card is 7" sq. which is a recently introduced, new card size. new stamp set - called Made with Love. all it cost was the postage. Hello again, thanks for your visit, I love comments. been up to and to check for the details. I coloured a piece of card by blending many autumnal colours. coloured sheet. They were then fussy cut. corner. The sentiment is by Stamps by Me. The leaves are by Sheena Douglass. the fabulous cards made by the design team. I have a red 6" card. A gold mirri and paper centre panel. Two gold glitter stips to decorate. Coloured with Promarkers and a gold pen.